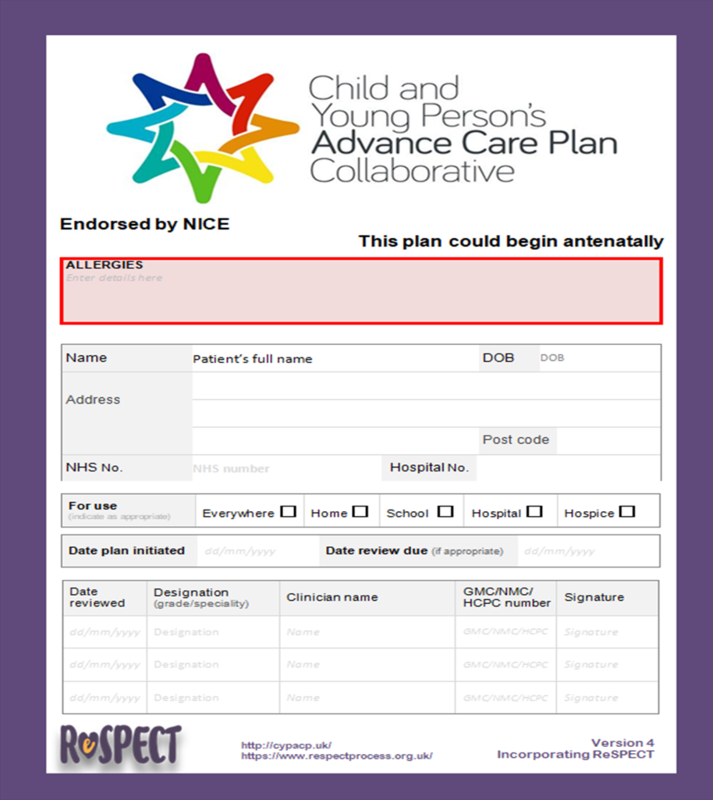 The long awaited Children and Young Peoples Advance Care Plan (CYPACP) collaborative version 4 template was released at the beginning of April. This new template, endorsed by NICE, and incorporating ReSPECT process documentation in the last two pages, has been developed following feedback from users of the previous version. The new template which can be started antenatally, is divided into three sections detailing Contacts, demographics & decision making , Wishes, and Emergency medical management. The fully funcioning electronic template automatically copies through demographic details and updates page numbers if the boxes are expanded when the form is filled. There is also an option for organisations to have their own ‘branded’ versions which may also have additional pages included at the request of the local team. The ReSPECT process as the National preferred standard for documentation of recommendations for clinical care in future emergency situations. The ReSPECT process for adults and children creates personalised recommendations for clinical care, providing health care professionals with a summary to help them to make immediate decisions about the person’s emergency treatment. The ReSPECT document, created through conversations between the person, their parents if the plan is for a child, and their health professionals, includes the individual’s personal priorities for care and agreed clinical recommendations about care and treatment that could help to achieve the outcome that they would want. This may include decisions about attempting or not attempting cardiopulmonary resuscitation. ReSPECT can be used as a stand-alone process or as part of a wider process of advance care planning. What do you want from the Northwest Paediatric Palliative Care Forum?